With 5 young builders working on independent projects, Friday's seem to be so busy that we don't even have a moment to capture all the action. I think that's quickly identifying itself as one of the main challenges for both collaborator and construction during open shop. In this environment we encourage planing so everyone has a clear direction on the days work through establishing next steps and some hopeful outcomes for the afternoon. These mini-meetings can take anywhere from two to ten minutes and happen before even picking up our first tool. Coming into the sunny and airy space of the shop after a full week of instruction can its own challenge for the majority of youth in this groups' age range but the mimi-meetings are designed to kickstart engagement by creating focus and excitement. Once we get started we frequently come across unforeseen complications which force us to rethink our plan or specific operation. We promote thoughtful reflection and asking questions in open-shop that require us to practice patience and the importance of assisting one other when working in shared spaces. This collaboration often prompts curiosity in each other's projects. It's so satisfying to hear the designer share their project or it's specific component when asked, "What are you building? What is this for? How does it work?" These interactions lend themselves to a lot of the positivity this group brings into the shop. These kids are learning to sharing much more then simply tools. They're exchanging laughs, stories and practical advice. Our second Friday open shop was an intense session full of functional problem solving. This group of kids did their homework and came came prepared with ideas, dimensions and scope for their work while in the shop. Henry came in with dimensions and material information that allowed him to get straight to designing the extension to an existing fort in his backyard. He's going to construct his walls in a modular fashion for easy transport and assembly at home. 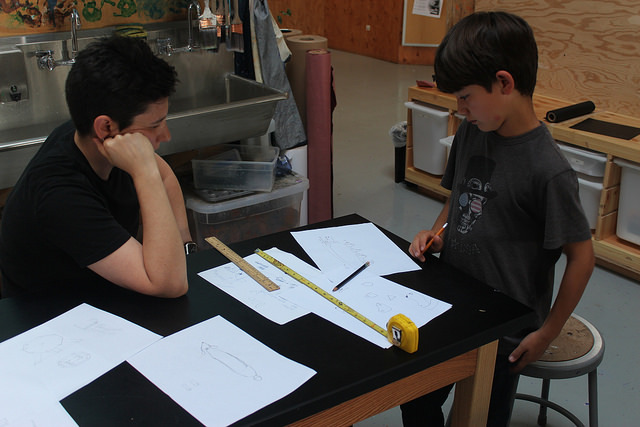 Determining the parameters for a personal sized boat, proved to be the greatest challenge of the day but Justin focused on his design for nearly the entire period. Appealing to many measuring devices available he contemplated size, dimensions and even a bit of trigonometry while remaining aware of constraints like buoyancy and how to seal his project so it won't sink. Faced with a space and storage constraint that had one builder reconsider taking on the project of constructing a skateboard half pipe. Lee went back to the drawing board determined to choose a idea that resonated with something important to him. Nico arrived with a great working design complete with measurements and material suggestions for his personal two-tier push cart. This allowed him to immediately begin working on his frame. Unfortunately, the cart's length was the single undetermined variable. Sometimes we get so excited about scale that it takes a parent's reminder how a six foot cart may not have space or function in the family's shed. So collectively we decided to shorten it next session. This fall we are really excited to be trying something new! We have opened our space (quite literally) to young builders. Our hope is that through providing kids with access to our tools, both practical and personal we will allow them to chase their own ideas and face adversity and failure head one. This is a complete reformat to our traditional approach. Here projects are kid-selected and kid driven. Although everyone was excited to dive right in and start building we still needed to review some basic tool training on drills, clamps and the chop-saw. To encourage kids' passion and independence our open shop doesn't only apply to space, it also includes access! Builders are granted uninterrupted access for up to 2.5 hours once or twice a week (depending on registration selection) to the shop and can come and leave as they please. We as collaborators hope that by allowing each other to conceptualize and control this constraint we will encourage one another learn from ourselves while working on own individual projects. Our first day held a wonderful example of how we can practice becoming autodidactic in the presence of one another. After we completed tool training we challenged our builders to practice their new skills by challenging them to construct something they could either sit or stand on. Although a couple of our first days' attendees opted for an earlier exit we had one pair of builder's stick around to the very end. The seat on Gabriel's chair was a few inches too high to balance him without his feet touching the ground but when he had the idea to pair it with Justin's sturdy stool, the two made quite a successful set!